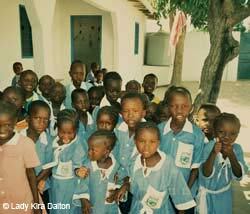 Kunta Kinteh Nursery was built solely by local parents as they were desperate for affordable, local nursery education. There is no Government funding for nursery education in Gambia, and the few private nurseries were too far away and much too expensive. All the building materials were provided by charitable donations from UK schools, other groups, and the African Oyster Trust Charity. Simple lunches were provided for the parents as an incentive while they were involved in the building work. When the school opened in September 2007, there were 60 children waiting to be enrolled. Since then, another two classrooms have been completed and there are now 120 children. We are very pleased to have an almost 50:50 ratio of boys to girls in a country where female education is still considered an unnecessary novelty.